Kawasaki Versys Forum > Kawasaki Versys 650 Motorcycle Talk > General Discussions - V-650 > Wind tippage! Need mirror recommendation. Wind tippage! Need mirror recommendation. So my bike was in the driveway under a cover that latches underneath. A flash storm happened a couple hours ago. Afterwards, I went to let the dogs out and my 2015 Versys 650 was laying on it's side! The cover was obviously acting like a parachute. No damage to bags, tank or anything, but the Madstad ws and the right mirror. Both demolished. I already ordered a new Madstad windshield. Do any of you have a recommendation on a set of mirrors? I imagine an aftermarket set would be cheaper than one OEM. They need to be as wide or wider than stock and look as terrific as the stockers. Thx! Last edited by onewizard; 12-09-2018 at 11:59 AM. Lours_Polaire and mrvwbug like this. Those do look nice. How do they compare width-wise to stock? I MUST see past my elbows! onewizard and Fastoman like this. What is the "Rock Auto" of motorcycles or anyone who might sell OEM parts cheaper than a dealer? I wouldn't mind finding out if the OEM one can be found cheap enough before I go aftermarket. I've settled into using Rocky Mountain ATV for factory parts and tires. Prices on OEM seem to be less than almost everywhere else and their tire prices rawk. They also facilitate any tire rebates. And they have a reward program. And real, live customer service if you call them. There are a lot of sites that sell OEM parts, but none are way cheaper than the dealer, like Rock Auto is. I don't care what you ride, just ride. And your turn signal didn't crack the fairing? I've bought many OEM parts over the years from RonAyers.com and Partzilla.com. Both are excellent to deal with, and prices are sometimes cheaper than your dealer's. 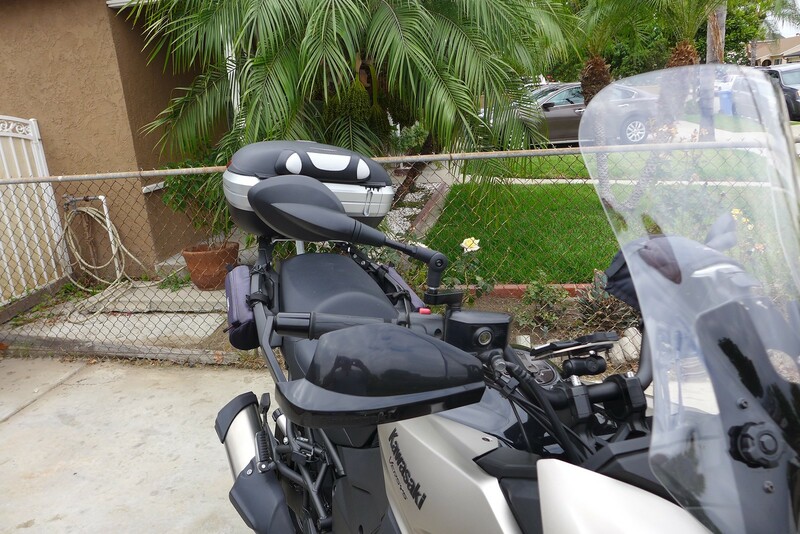 BTW, I'm very happy with the OEM mirrors mounted on Motorwerk extenders. Great field of vision. I need mirror extenders with all my mirrors. Seems i'm kinda wide. Joe don't be ashamed of being a "wide body." In the world of things airline, all the pilots greatly desire the wide body jets as they are the newest, most sophisticated, and PAY the most to fly. Wide does have it's benefits, after all...Lol. onewizard and weljo2001 like this. Yeah. I just double checked after work tonight. No other cracks or damage, except the bottom edge of the right bag is scuffed. Not deep, so I might be able to get that out. The cover, which is likely the reason it got blown, over protected it from any major scuffs elsewhere. I'll look into both sites and also the Motorwerk extenders might be nice too. Thx for the tips! I had forgotten about Partzilla even though I bought my OEM top case and gear indicator from them 3.5 years ago. Doug Just Doug likes this. Last edited by Squishman; 10-04-2018 at 08:10 PM. Thanks Steve. I will look into that one too. 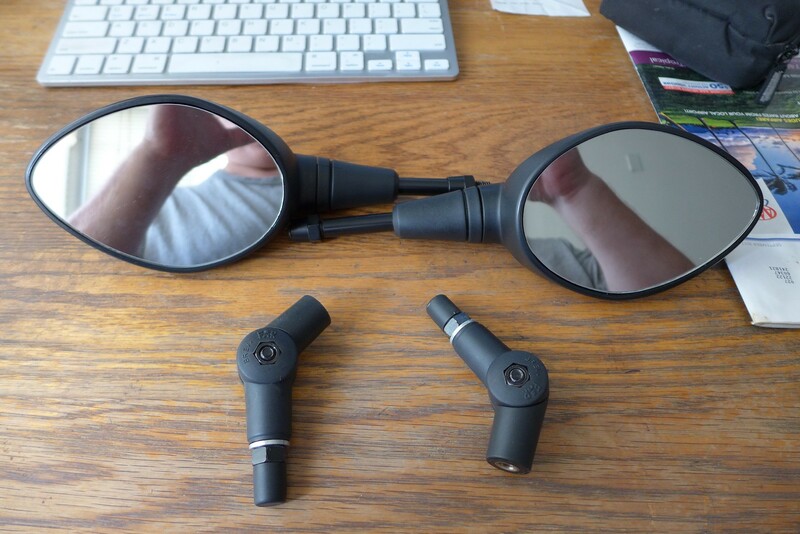 I bought a used OEM mirror off of ebay for only $27.50, free ship. Now all I need to do is polish out the scuff on the side bag. Last edited by onewizard; 10-06-2018 at 10:15 AM. I see you already did it. Does anyone know if you can remove and re-install the glass on the mirror without breaking the glass? If anyone has does that before. The post on the used one that I bought has a little black enamel chippage. The original one looks like new so I wouldn't mind trading posts. New Madstad shield comes Monday.